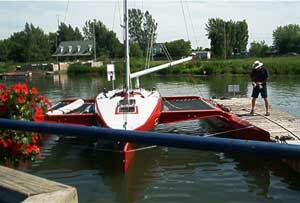 See some pictures of this boat. 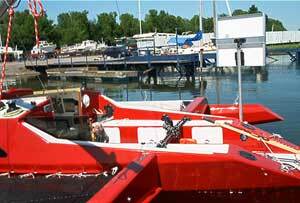 The ring frame and folding system is structural grade aluminium. 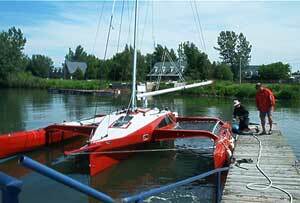 Boat built by Michel Dequet in Canada. The forward double bunk has a watertight stowage below. In the main cabin there is a single berth port and starboard (the portapotti is under starboard settee). Space is provided port and starboard just forward of the main bulkhead for a stove and sink with an ice box under the stove. The space under the cockpit can be used as a single bunk if required. Stowage is provided under all bunks and the settee for clothing, food and drinks. 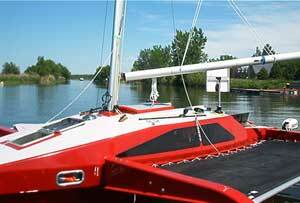 The Scarab 8.0 will appeal to sailors who are after an economical, easy to build trailable trimaran. 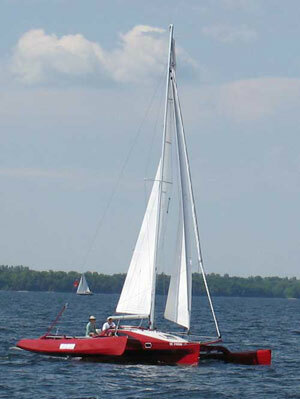 The rig is manageable but powerful enough to provide excellent performance for racing and the accommodation is sufficient for cruising for a couple or small family. Plans: the full plan set is required if the you want to build this boat. It contains all the information and dimensions required. The plans are presented in PDF format. These can be printed on your home printer on A4 size paper or sent to a photo copier to enlarge to A3 size. Plans consist of 51 drawings, Material list and construction manual in PDF format emailed within 24 hours.